You can now harvest WiFi signals and turn it into power to charger up your mobile phone or netbooks. This little box has, inside it, some kind of circuitry that harvests WiFi energy out of the air and converts it into electricity. This has been done before, but the Airnergy is able to harvest electricity with a high enough efficiency to make it practically useful: on the CES floor, they were able to charge a BlackBerry from 30% to full in about 90 minutes, using nothing but ambient WiFi signals as a power source. Fast food lovers may finally feel a little less guilty about getting greasy burgers. One New Jersey Burger King recently equipped its drive-thru with a speed bump that harvests electricity from cars that pass by. 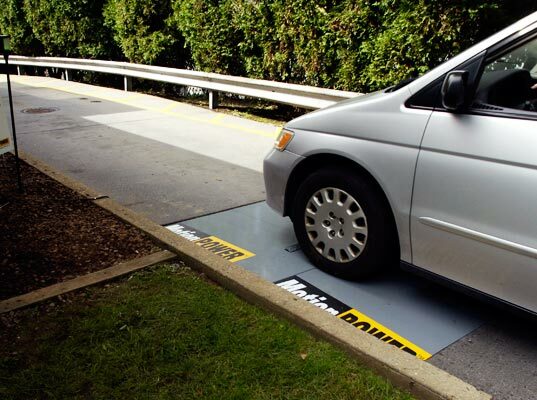 The speed bump is part of a pilot project from New Energy Technologies, and if all goes well, drivers could see energy-harvesting speed bumps at drive-thrus, toll plazas and even shopping centers. The speed bumps, or “MotionPower Energy Harvesters,” look much different from your typical concrete humps. The “bump” is actually flat, with long, skinny pedals running across the top. As cars drive over the speed bump, it pushes the pedals down and turns the gears inside. The spinning creates about 2,000 watts of electricity from a car moving at five miles per hour. Energy created by the cars is instantaneous (like solar and wind power), meaning that speed bump developers must also figure out a way to store power for later use. To that end, developers at New Energy Technologies are currently experimenting with mini-flywheels (a device that stores energy by spinning), and also plan to look into supercapacitors and other energy-storing mechanisms. Eventually, once storage is perfected, the speed bumps could be used to power street lamps or even feed power directly to the grid. While the pilot project has seen encouraging results, don’t expect to see energy-harvesting speed bumps at your local Mickey D’s anytime soon: The devices won’t be commercially available til sometime next year. Still, it’s intriguing to think that those midnight french fry cravings may help create clean, renewable power. Outside of Israel and Shai Agassi’s electric vehicle (EV) infrastructure company Better Place, the Middle East doesn’t have much of an electric car industry. 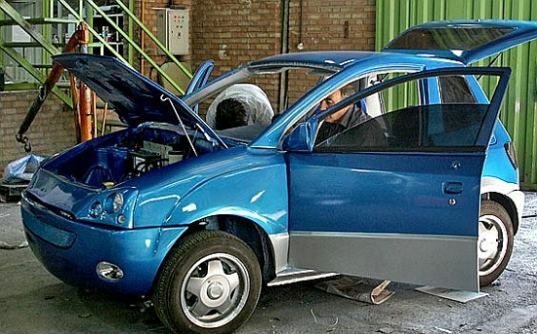 That might change soon now that a team of Iranian scientists from Tehran’s Khaje Nasir Toosi University of Technology have developed the country’s first EV, a mini two-seater called “Qasedak-e Nasir”, or the dandelion of Nasir. 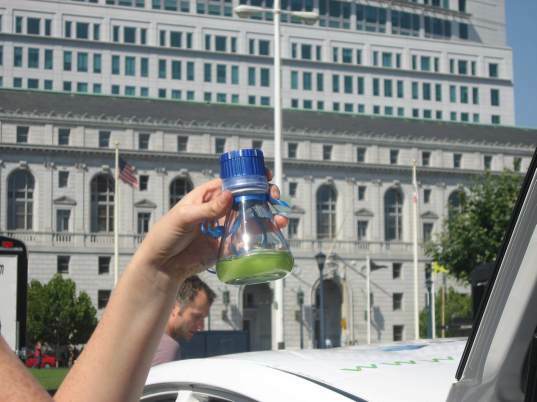 Powering our cars with algae-based fuel could be the next Apollo mission.” That’s what Rebecca Harrell, co-founder of the Veggie Van Organization and producer of the upcoming film FUEL, told me yesterday in front of San Francisco’s City Hall. Over the next 10 days she’ll be joined by Fuel director and Veggie Van Organization cofounder Josh Tickell as they take the Algaeus, along with a caravan of other green energy vehicles (including the Veggie Van and the biodiesel-powered big green energy bus), on a cross-country road trip. “It hit us that we needed to drive the car across the country,” Harrell said. “People think of algae fuel as this long-term, far off thing. But seeing is believing. The new BMW ActiveHybrid X6 xDrive50i: world’s most powerful hybrid! The BMW ActiveHybrid X6 is truly mind-boggling. It’s an SUV, but the sloping roofline and two seats at the back kind of limit its utility and storage space. And it’s a hybrid which people usually associate with economy, yet its mated to a massive V8 twin turbocharged engine. There is not one but two electric motors, and the vehicle ends up having more torque than the BMW X6 M, a full 100Nm more to be exact. After teasing us for months with prototypes and promises, Nissan unveiled a sleek five-passenger electric hatchback with a claimed range of 100 miles. 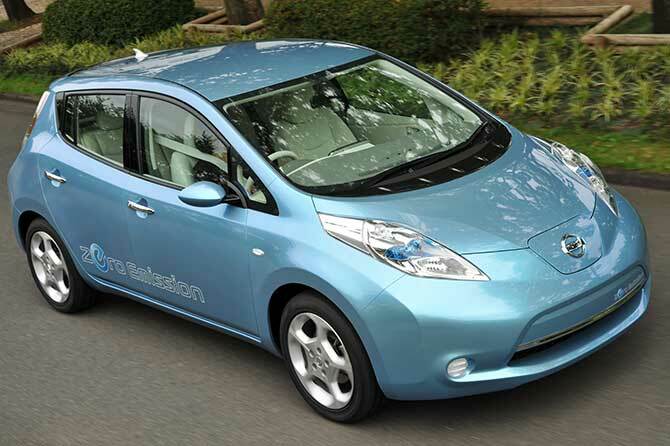 It’s called the Leaf, and Nissan says it will be here next year. Nissan isn’t saying what the Leaf will cost — look for a price in the $25,000 to $30,000 range — but promises it will be the first affordable, practical electric car when it goes on sale in the U.S., Japan and Europe by the end of 2010. Imagine a future in which wireless power transfer is feasible: cell phones, household robots, mp3 players, laptop computers and other portable electronics capable of charging themselves without ever being plugged in, freeing us from that final, ubiquitous power wire. Some of these devices might not even need their bulky batteries to operate. A team from MIT’s Department of Physics, Department of Electrical Engineering and Computer Science, and Institute for Soldier Nanotechnologies (ISN) has experimentally demonstrated an important step toward accomplishing this vision of the future. The team members are Andre Kurs, Aristeidis Karalis, Robert Moffatt, Prof. Peter Fisher, and Prof. John Joannopoulos (Francis Wright Davis Chair and director of ISN), led by Prof. Marin Soljacic. Realizing their recent theoretical prediction, they were able to light a 60W light bulb from a power source seven feet (more than two meters) away; there was no physical connection between the source and the appliance. The MIT team refers to its concept as “WiTricity” (as in wireless electricity). The work will be reported in the June 7 issue of Science Express, the advance online publication of the journal Science. Best Buy has signed on to sponsor Brammo’s electric motorcycle racing team in a deal that could see the consumer electronics retailer sell battery-powered motorcycles alongside laptops and DVD players. Beyond providing the Oregon motorcycle manufacturer with an outlet for its Enertia street bike, the arrangement gives Brammo the financial support and technical assistance to compete in next month’s zero-emission TTxGP motorcycle grand prix. Brammo is one of 18 teams bringing 23 bikes to the Isle of Man for the June 12 race around one of the most storied courses in motorcycling. “It’s a great way to show what the future of our product is and to test the technology that will end up in consumers’ hands,” company CEO Craig Bramscher told Wired.com in an exclusive interview. The team goes by the unwieldy name of Team Brammo Enertia Best Buy Racing, and it has assembled two very sweet motorcycles. Businesses are undergoing a ‘massive paradigm shift’ to green computing, said a Microsoft exec whose new tool offers to help. Once, businesses were interested in green computing mainly as a matter of corporate responsibility. But now, increasing regulatory pressures and skyrocketing fuel prices are spurring companies to want to take a very hard look at both their carbon footprints and energy costs, according to Jennifer Pollard, a senior product manager at Microsoft. Earlier this month, Microsoft released the first edition of a tool aimed at taking the heavy lifting out of measuring the environmental impact of business activities and tracking your company’s expenditures on oil, gas, and other forms of energy. 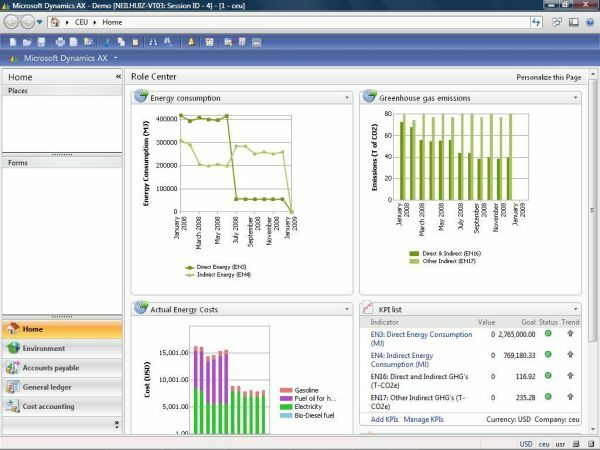 Available free of charge to Dynamics AX 2009 customers, the new Environment Sustainability Dashboard sits directly on top of Microsoft’s ERP system, displaying information captured elsewhere in the system in easy-to-read reports, Pollard said, in a briefing for Betanews. Information about a company’s expenditures on energy might be funneled from purchase orders (POs) or invoices within the AX 2009 system, she illustrated. With this information readily at hand in graphical views, it grows simpler for businesses to reduce their energy costs and carbon footprints.